From lavish interiors, a serene atmosphere, world-class beats, and meals that will flirt with your taste buds with every bite, Buddha-Bar Manila is a haven located at the heart of Makati that will let you experience the simple yet rewarding pleasures of life. Buddha-Bar Manila stands out as one of the most unique and luxurious 7-star bar-restaurant-lounges in the country, and now, thanks to their latest generous promotions, everyone can discover what the Buddha-Bar experience that everyone’s craving for is all about. For starters, take pleasure in a sophisticated dining experience with the Early Bird Promo that runs from April 25 to July 25, 2016. 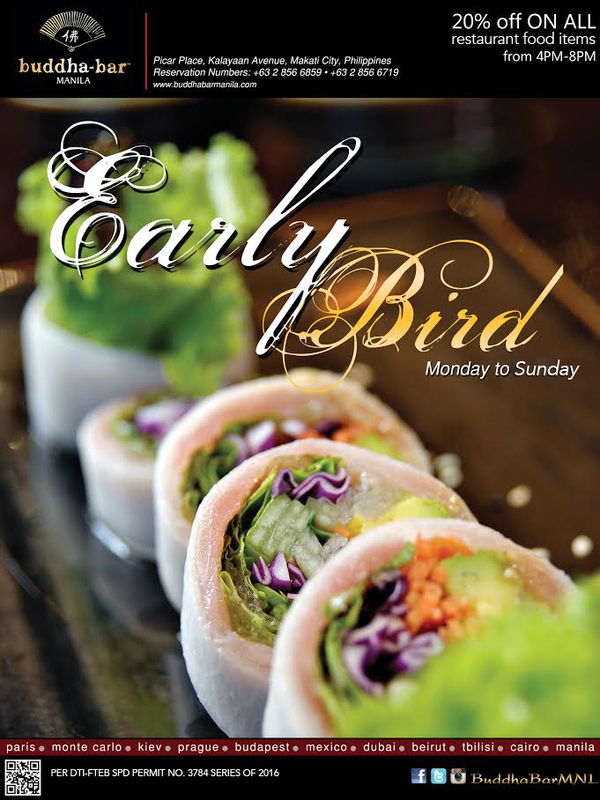 Early Bird Promo customers get a 20% discount on dinner a la carte menu at the restaurant area Monday to Sunday from 4:00 PM to 8:00 PM. After feasting on the succulent dishes, get stylishly wasted with Buddha-Bar Manila’s Happy Lounge Promo that runs from April 25 to July 25, 2016. Happy Lounge customers get a 50% premium on all standard drinks by the glass every Monday to Sunday from 4:00 PM to 8:00 PM and 50% premium on selected list of liquors by the bottle from 10:00 PM to 2:00 AM. The impressive array of Happy Lounge bottle specials includes 42 Below Vodka, Absolute Vodka flavor varieties (Citron, Kurant, Vanilla, Raspberry, Mango, Mandarin, Pears), Jack Daniels, Johnny Walker Black Label and Jose Cuervo Gold Tequila. 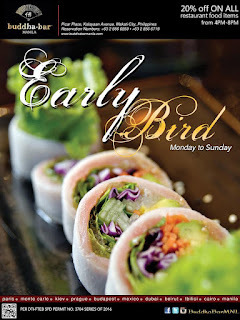 Both Early Bird and Happy Lounge Promos are valid for dine-in customers only. Take-out food and/or bottle keep are strictly prohibited. These promos are also not valid in conjunction with existing discounts, party packages, banquets, promotions, Buddha-Bar Manila initiated events and the like. Dining in Buddha-Bar Manila also gives you a chance to win a brand new Maserati Ghibli with every single receipt purchase worth Php 5,000 on a la carte menu and PhP 30,000 on banquets and events. This promo runs until January 28, 2017. Buddha-Bar Manila, a franchise of Buddha-Bar Paris, is located at Picar Place, Kalayaan Avenue, Makati City. Early Bird customers must reserve tables/seats with our reservation officers at (63)2 856-6719, (63)2 856-6859, and 0998-9833918. You may also reach them at info@buddhabarmanila.com or like and follow them on Facebook, Twitter, and Instagram.